Butter Tart Squares are simply irresistible with their buttery shortbread crust that is topped with a rich and gooey caramel-like filling. They are similar to a Butter Tart, only in bar form. To make these Butter Tart Squares, the first thing we do is make the shortbread crust which is pre baked until golden. This keeps the shortbread nice and crisp. You can make the shortbread and the filling in your food processor or mixer. The filling used here is a little different than what I used for the Butter Tarts as it contains light corn syrup which makes it slightly soft and runny (gooey). Instead of light corn syrup you could use golden syrup or even agave. Although the Butter Tart is unique to Canada they are quite similar to the American pecan pie or the British treacle tart. In fact, even though the filling for these Butter Tart Squares uses either raisins or chopped walnuts, you can just as easily use chopped pecans to emulate the pecan pie. These squares are excellent warm, at room temperature, or even cold. 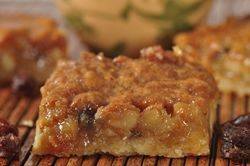 Butter Tart Squares: Preheat your oven to 350 degrees F (180 degrees C). Butter (or spray with a non stick cooking spray) an 8 inch (20 cm) square baking pan. Shortbread Base: In your food processor, place the flour, sugar, and salt and process to combine. Add the cold butter and pulse until the dough starts to come together and form clumps. Transfer the dough to your prepared pan and, using your fingertips, evenly press the dough onto the bottom of the pan. (Can use the back of a spoon to smooth the surface of the pastry.) Gently prick the bottom of the crust with the tines of a fork. (This will prevent the crust from puffing up while it bakes.) Bake for about 20 minutes, or just until pale golden in color. Remove from oven and place on a wire rack to cool while you make the filling. Filling: In your food processor (or with a hand mixer), process (or beat) the butter and sugar until light and fluffy. Beat in the eggs until incorporated. Scrape down the sides of the bowl as needed. Then beat in the corn syrup and vanilla extract. Stir in the flour, salt, and baking powder. Sprinkle the nuts evenly over the baked shortbread base. Then pour the filling over the nuts and bake for about 20 - 25 minutes or until the filling is set. Remove from oven and place on a wire rack to cool. Serve at room temperature or chilled. Makes 16 - 2 inch squares.